Oil palm is grown as an industrial plantation crop, often (especially in Indonesia) on newly cleared rainforest or peat-swamp forests rather than on already degraded land or disused agricultural land. 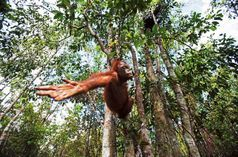 Indonesia and Malaysia Palm Oil Companies have destroyed enormous tracts of tropical rainforest which contain the world’s longest lists of threatened wildlife. Of the more than 400 land mammal species of Indonesia, 15 are critically endangered and another 125 threatened. Of Malaysia’s nearly 300 land mammal species, 6 are critically endangered and 41 threatened. The numbers of threatened species climb higher when terrestrial reptiles, amphibians, birds, insects, spiders, flowering plants, non flowering plants and trees are included and climbs to . There are over 300,000 species which live in Indonesia & Malaysia. Moreover, certain animals, such as the orangutan, sun bear, Sumatra tiger, pygmy elephant and others, are only found in these countries; when their rainforest habitat vanishes, so will they. Five mammals exemplify the impending disaster: the Sumatran tiger, Sumatran and Bornean orangutans, Asian elephant, and Sumatran rhinoceros. Each of those species is endangered, with the 3 Sumatran species critically endangered. They once flourished in precisely those areas where rainforests have since been cleared for oil palm. Plantations also pollute the soil and water with pesticides and untreated palm oil-mill effluent, cause soil erosion and increased sedimentation in rivers, and cause air pollution due to forest fires. The demand for palm oil is forecast to double by 2020. The expected thousands of square miles of new plantings on the islands of Sumatra and Borneo could kill off the remaining orangutans, rhinos, and tigers. In Indonesia and Malaysia, new plantations are often established in newly cleared rainforest and peat-swamp forests (sometimes with an intermediate period of logging), instead of on degraded land or disused agricultural land, such as old rice paddies or old plantations. That’s because it costs much more to rehabilitate disused agricultural land to prepare it for oil palm than it does to clear new land. A further incentive in many cases is that the plantation company can finance its new planting by logging and selling valuable tropical timber trees. 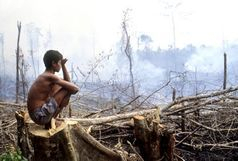 Burning of logged-over forests and debris is still a widespread means of clearing land for oil palm plantations, despite the fact that Indonesia made burning illegal after massive plantation-initiated wildfires in 1997–98. Cash is recouped much faster if a company clears land cheaply by burning after logging and then plants oil palm, rather than waiting years for valuable timber trees to grow again— unlike timber, agricultural crops are short-term investments that increase cash flow quickly investments that increase cash flow quickly. The Oil palm has been the direct cause of a host of ecological problems including deforestation; endangered wildlife species; habitat destruction and fragmentation; soil, air, and water pollution and toxic chemical contamination; and last—but certainly not least—social conflict and displacement of local communities. Why Are Tropical Rainforests Important? Most Indonesian and Malaysian terrestrial species are forest animals and can survive only in rainforest habitat, not on plantations. Once oil palm has replaced the immense variety of hundreds of species of trees, vines, shrubs, mosses, and other plants found on every acre of lowland rainforest, most animals can no longer live there. An oil palm plantation is, in effect, a “biological desert.” As an industrial plantation crop, oil palm is grown as a monoculture. Most of the other plants found are low-growing ground cover.65 Without the rainforest’s plenteous variety of fruits, nuts, leaves, roots, nectar, bark, shoots, and other plant materials to eat, most animals cannot survive. And, without plenty of plant-eating prey animals such as deer to hunt, carnivores such as tigers cannot survive either. The plantations provide habitat for only 20 percent or less of the previously resident mammals, reptiles, and birds.